It is human nature to give names and group things in order to: better understand, relate, educate, promote, profit and or give strength to the quantity. Corporations, Politicians, Advertising Firms, Lobbyists and the Media are especially interested in the grouping of ages and generations of people. This article will look at definitions, origins and current terms and uses for Demographic Generations. As seen by Daniel Webster’s usage of Genesis, the term meaning generation has been used for more than three millenniums; and before the day of Moses more than 3,300 years ago. In the Genesis Chronology we find 10 generations to Noah, and according to the King James and Hebrew Bibles, Noah lived 350 years after the Flood which occurred 1,656 years from the Creation of Adam; thus, making those generations about 200 years each. Then, we see in Genesis 6:3 that the “days of man” were reduced to about “120 years” and the time from Noah’s sons to Abraham (Shem’s birth; 1558 years from Adam), also 10 generations, was about 430 years to Abraham was a man or 465 years until he was called according to Genesis. Thus, for that time a generation was about 46 years. The Gospel of Matthew, chapter 1 gives specific names and records, “the genealogy of Jesus Christ… all the generations from Abraham to David are fourteen (14) generations; from David until the captivity in Babylon are fourteen (14) generations, and from the captivity in Babylon until the Christ are fourteen (14) generations.” Thus using the Hebrew Bible and King James Version Bible, we add 20 generations from Adam to Abraham + the 40 since Abraham to the time of Christ and get 60 generations. Obviously, there were lineages that have many offspring quicker, such as in Mary’s case recorded in the Gospel according to Luke. According to the Encyclopedia Judaica, the Toldot Am Olam and other traditional Jewish sources, the Jewish calendar put 1 AD at the year 3,761; and likewise according to www.hebcal.com the current Jewish Calendar year is 5777, which most nations called 2017. So applying a little mathematical Midrash, 3,761 ÷ 60 = then a generation would live about 63 years, and have their children at some average point between 20 and 30 years. Traditionally, people have used between 20 and 70 years, and often say 40 years to be a generation. This is an arbitrary or subjective number, and according to one of Webster’s definition, or the use in the Ten Commandments (Exodus 20:5) or as in the longest recorded Name of God (Exo. 34:7) – “upon the children and the children’s children to the third and the four generation” – a generation would have been during their entire lifetime. However, as Webster informed us, the term is associated with people living during the same time or period; and here we get more modern definitions and uses. In 1953, Hungarian Robert Capa, an acquaintance of Ernest Hemingway and a professional war photographer (who died at age 40 after stepping on a landmine) coined the term ‘Generation X.’ Capa said concerning his title for a photo-essay in Picture Post (UK) and Holiday (US), “we named this unknown generation, The Generation X, and even in our first enthusiasm we realized that we had something far bigger than our talents and pockets could cope with…” And it was Capa’s friend and fellow journalist, Hemingway (1899-1961), that in his 1926 novel, The Sun Also Rises, wrote, “…you can’t get away from yourself by moving from one place to another…” then, quoted American novelist Gertrude Stein (1874-1946), “You are all a lost generation.” Supposedly, Hemingway said that Stein heard the phrase from an auto-garage owner. The point is that typically terms and phrases have been used before being coined by the one that gets the credit. Nevertheless, ‘silent generation’ appeared in a 1951 essay in Time magazine (referring to the ‘McCarthy era’); the term ‘generation gap’ began to be used in the 1960s; and the phrase ‘Baby Boomer’ – referring to those born after WWII by the GI generation – appeared in the Washington Post’s Outlook section in 1977. The term ‘baby boom’ was used in the late 1800s. The phrase ‘the Greatest Generation’ has been used to refer to this G.I. (General Issue or Government Issue) Generation; and was given significance by Tom Brokaw’s 1998 book The Greatest Generation. Now, as approached the year 2000 [according to the Gregorian solar-based calendar (Catholic Pope Gregory XIII; 1582 – “Calendarivm Gregorianvm… Anno M. D. LXXXII”] many people began to use it for their purposes. For example: the world will end based on Biblical Chronological – mainly from misinterpretations of Usher’s Chronology and the 6,000 year theory; computers will fail; there will be food shortages and possible chaos; and of course, it was a new century and a historical new millennium – not according to the Jewish or Muslim calendars; but according to Christian Nations and Gregorian calendar. And thus, college students and educated English reading peoples came to understand the term Millennial was a reference to the year 2000 and the new 21st century, entering the 2nd, 5th or 6th millennium or thousandth year depending on your application of received information (though the 6th century is impossible according to the Jewish Calendar and the Holy Scriptures – only possible from misapplied evolutionary theories). Thus in 2017 www.merriam-webster.com defines Millennial as “relating to a millennium… a person who was born in the 1980s or 1990s…” The date of birth is significant in that those came to young adult age in 2000 and the new millennium. However, other historians, marketing professionals, college professors, media personalities and the like – including MTV – have put their spin on what generations are called and their brackets of ages. 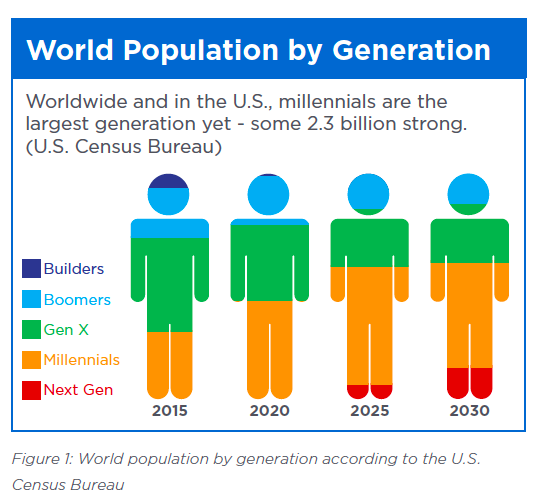 The Boom is called the Baby Boomers, the Millennial Generation has been assigned Generation Y – Young Adults, the Federation Generation, etc. ; and the current generation as Generation Z or the Builders. In the book, The Next America: Boomers, Millennials, and the Looming Generational Showdown (2016), by ‘Paul Taylor and the Pew Research Center,’ they examine the demographics of “four adult generations: Millennials (ages 18 through 35), Gen Xers (ages 36 to 51), Baby Boomers (ages 52 to 70), and the Silent Generation (ages 71 to 88).” Thus, these are the names and ages based on 2016, that one of the most recognized Research ‘fact tanks’ in the world assign. Other sources use various names and dates, but as people, students and professionals around the WORLD desired use and clarity on the issue – a norm will be form. Like other developed theories and works; college texts, global media sources and international businesses are beginning to use the same definitions. Trade and professional journals, such as The Journal of Consumer Marketing took up the topic and published J. Dietz, Defining Markets, Defining Moments: America’s 7 Generational Cohorts, Their Shared Experiences, and Why Businesses Should Care; [2003; 20(2/3), 172-174]. And professional organizations have followed; such as Macrothink Institute using dates by Dietz, Geraci, Howell and others.